Tessa is used to being portable. She and her hippie mom have never really had a true home, instead they just wander around, following random guys and crummy jobs. And now they are moving yet again, only this time to an ashram for an "extended retreat". While her mom loves it there, Tessa just thinks all of the people are weird, and she can't help but feel a bit hurt at how everyone seems to overlook her. But then she meets Colin: twenty-years-old, funny, and normal. They connect through their shared love of music and begin to spend more time together. But as time goes by, Tessa finds herself drifting farther away from her mother and taking more and more risks until one day, everything backfires. The concept for Karma for Beginners is really intriguing and entertaining. Tessa's voice is funny, smart, and authentic, but in her narration you can really feel her insecurity and yearning for a normal life, to know her father, and to have a mother who isn't a flake. Tessa's perception of the other people at the ashram is humorous and oftentimes insightful as she learns more and more about the place, and it even takes on a slightly creepy air as its cult-like inner workings are slowly revealed. The romance between Tessa and Colin is sweet, despite their age difference, and will leave you smiling, but about three quarters of the way through the book everything turns sour as drugs are introduced, and many pages are spent on Tessa's meandering thoughts as she is high. The secrets concerning her mother and what really is going on at the ashram are glossed over in the end, leaving you wondering about the details of what all really happened, and the conclusion seems a little too rushed and a little too unrealistic. 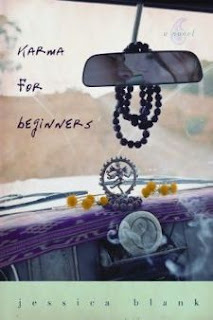 However, overall Karma for Beginners is an interesting and unconventional novel about one girl's coming-of-age with an engaging and sympathetic narrator that teens can really identify with. Cover Comments: I love the colors used in this cover. I think they work well together, and I like how it is a picture of the inside of a car as that is where Tessa and Colin spend most of their time together, even if the inside of their car didn't look like this. It's whimsical and very easy to picture a scene like this in the ashram Tessa describes (sans the kissing couple, of course! ); an excellent cover. A book I didn't enjoy too much because of the lame ending attempt. Sounds really great. Nice review. Though I dont like books with rushed endins, I'll give it a try!!! I love the cover as well! And it's one of the books in my Friday Finds :) I look forward to reading this! Sounds very interesting! Will check it out.